I am a faculty member for the International Institute for Analytics (IIA). 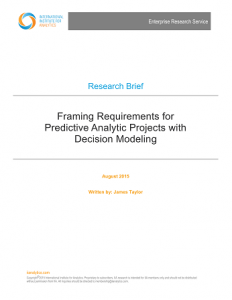 I have been working on some research on framing predictive analytics project requirements. As part of this research I have published an IIA research brief and recorded a briefing. These discuss decision modeling, a new technique for framing a business problem so it can be effectively solved with predictive analytics. In them I introduce the basic concepts behind decision modeling, discuss a real world example, and explain how decision models can be effective tools for defining predictive analytic requirements. IIA Members can listen to the briefing or read the research brief. If you are not already a member and are interested you can get details and sign up here.